shop, study, play and grow old. Not the most thrilling look at the future. It's kind of like they knew there was a thing or two wrong with the old home town. But the Rock and Roll Hall of Fame is there. Drew Carey is from Cleveland. 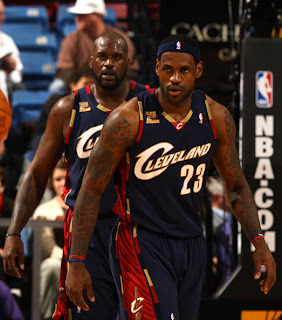 Lebron James and Shaq play for their basketball team. And, my favourite Christmas movie, A Christmas Story, was filmed there. But apparently none of that's good enough for Forbes.com. 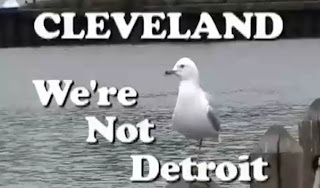 They've conducted a poll that rates Cleveland the most miserable city in the United States. What were the key things that propelled Cleveland to the top, er, ah, of the bottom? High unemployment, dismal weather, hefty taxes, corruption and mediocre sports teams. Mediocre sports teams? Ah, thank goodness they don't count mediocre sports players. Not you Lebron, your aging new partner. The city's reigning (get it? ), over-taxing, corrupt politicians where mediocre sports teams play may want to think about changing that mission statement. Moooooog: That was hilarious and totally explains the outcome of the forbes.com poll! UR: There is no most miserable place in Canada. We just enjoy sitting back and laughing at you Americans. But don't tell anybody. It'd spoil our image. We keep having "the most miserable town in Britain" contests and most of my local towns have won it at one time or another. Personally I quite like the sound of Cleveland. I've never heard anything nice said about Cleveland, but I do remember when they had the best running back in pro football playing there-Jim Brown! Don: He was a hell of a player and some of his records still stand. But the Browns never seemed to return to that kind of greatness, never going to the Super Bowl after the league merger in 69. Sad. What's a Cleveland? Never heard of it. Is it anything like Disneyland? Cause I visited the one in France and it was pretty decent. Hardly miserable at all, really. A Christmas Story? That is MY all-time favorite Christmas movie! So Cleveland's the most miserable, eh? We (here in a little town called Mesa, AZ) had the dubious honor of being named the most boring city. I'm pretty sure we still are. But hey, I'll take it! HA! Ziva: Nothing like Disneyland. It's a mid-western manufacturing city hard hit by the economy...and miserable. Quirks: Most boring? Don't they know that you live there??? I've been to Cleveland a time or two...I liked it,but maybe that's because I knew I didn't have to live there! thinkinfyou: I guess Cleveland invented the expression, "Nice place to visit - wouldn't want to live there"
Oh poor Cleveland! But they are not Detriot! Thank goodness. AmyLK: No Cleveland's miserable. Detroit's just depressed! Hah! Thanks for the laugh. And two friends are trying to get us to join them for a little vacation in Cleveland this Summer, as they called to remind us today. Then again, a few days at the Rock and Roll Hall of fame then at a Yankee game we can possibly get into without going broke don't sound too bad. Note to Unfinished Rambler: It's Winnipeg, hands down. I've been there, and I ain't going back. I think I drove through Cleveland to get there, too. Kablooey: Spread it out over two days. Otherwise it'll be an even shorter vacation! Mike: That's the "coldest" place in Canada - the corner of Portage and Main. But Winnipeg isn't miserable. They have a football team (Canadian, I know) and there's a rumour they're going to get their hockey team back.